ACCP. Effectiveness, Safety, and Acceptability of Cryotherapy: A Systematic Literature Review. Seattle, Washington: PATH (January 2003). Anderson M, Jordan J, Morse A, et al. Integrated Colposcopy. 2nd ed. London and New York: Chapman Hall Medical (1996). Burghardt E, Pickel H, Girardi F. Colposcopy Cervical Pathology. Textbook and Atlas. Thieme, New York (1998). Campion M, Ferris D, di Paola F, Reid R. Modern colposcopy-A practical approach. Augusta.Educational System Inc. 1991. Cartier R, Cartier I. Practical Colposcopy. 3rd edition. Paris: Laboratoire Cartier (1993). 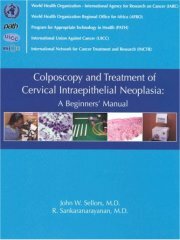 Coppleson M, Reid B, Pixley E. Colposcopy, 3rd Edition, Charles C Thomas, Springfield (1986). Coppleson M, Dalrymple JC, Atkinson KH. Colposcopic differentiation of abnormalities arising in the transformation zone. Obstetrics and Gynecology Clinics of North America 20:83?110 (1993). Franco E, Monsonego J. New Developments in Cervical Cancer Screening and Prevention. Oxford: Blackwell Science (1997). IARC Monographs on the Evaluation of Carcinogenic Risks to Humans. Volume 64: Human Papillomaviruses. International Agency for Research on Cancer, Lyon, 1995. Singer A, Monaghan J. Lower Genital Tract Precancer Colposcopy, Pathology and Treatment. 2nd Edition. Blackwell Science, Oxford (2000). Soutter P. Practical Colposcopy. Oxford: Oxford University Press (1993). Wright VC, Lickrish GM, Shier RM. Basic and Advanced Colposcopy. Part 1: A Practical Handbook for Diagnosis, 2nd ed. Houston, Texas: Biomedical Communications (1995). Wright VC, Lickrish GM, Shier RM. Basic and Advanced Colposcopy. Part 2: A Practical Handbook for Treatment, 2nd ed. Houston, Texas: Biomedical Communications (1995). Wright TC, Richart RM, Ferenczy A. Electrosurgery for HPV-related Diseases of the Lower Genital Tract. New York, Arthur Vision Inc. (1992).